Rensselaerville Volunteer Fire Company Seeks New Members | Is there a FIRE in you? The East Berne, Berne, Westerlo, Medusa and Elsmere Volunteer Fire Companies helped their brothers and sisters in Rensselaerville celebrate the new truck. Always a good time at a wet down! This entry was posted in Special Events and tagged Carey Institute for Global Good. Music, Elsmere Volunteer Fire Companies, youtube on May 18, 2015 by rensselaervillevolunteerfireco. 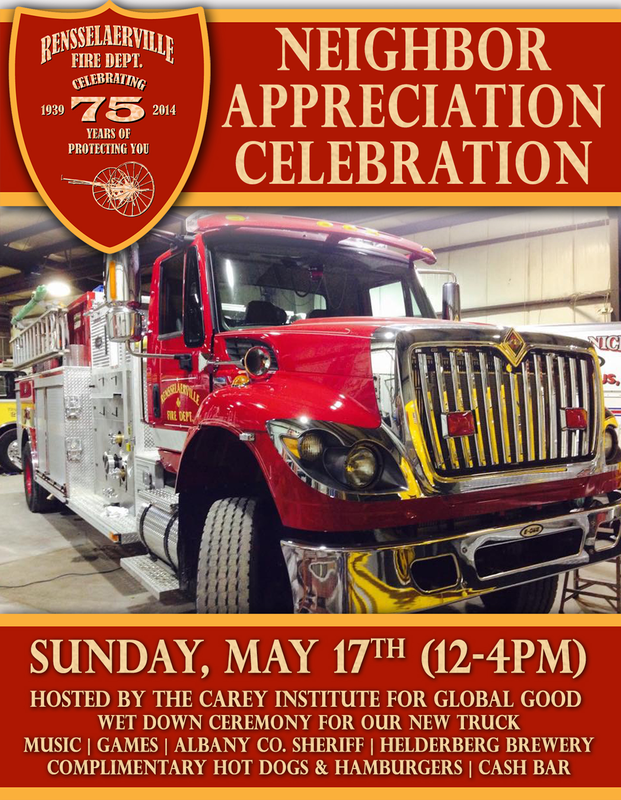 This entry was posted in Special Events and tagged Albany County Sheriff, Carey Institute for Global Good, Celebration, Fire truck, Hot Dogs & Hamburgers, Neighbor, Wet Down Ceremony on May 6, 2015 by rensselaervillevolunteerfireco. Members of the Rensselaerville Volunteer Fire Company and Medusa Volunteer Fire Company participated in a field trip to the Communications E-911 Center in Voorheesville and the Albany County Emergency Management Office in Clarksville. Chris Heath of the Communications E-911 Center gave the firefighters a guided tour highlighting the capabilities and a detailed explanation of how 911 calls are processed and how responders are dispatched. Important information for the volunteers who depend on timely and accurate information need to respond quickly and to obtain the necessary equipment and resources to respond effectively to emergencies. Search & Rescue: Provides state-of-the-art technical rescue response, advice, or support to requesting municipalities and/or public safety agencies. Pinpoint meteorology provided by a certified forensic weatherman. This entry was posted in Volunteer Training and tagged Albany County, free training, life skills, Medusa, neighbors helping neighbors, Rensselaerville on April 14, 2015 by rensselaervillevolunteerfireco. Rensselaerville 75th Anniversary Proclamation: Cecilia F. Tkaczyk New York State Senator for the 46th district was on hand to congratulate and give them a special recognition and read a proclamation which was presented to Chief Robert Tanner. Firematics Games at Rensselaerville VFC’s 75th Anniversary Celebration: Firematics games were held with neighboring fire companies to commemorate the occasion of Rensselaerville VFC’s 75th anniversary. The games involved “Donning and Doffing”, wall breaching, tunnels, firemans carry, bucket brigade, pump and hose operations. The Berne and East Berne, Medusa, Tri Village, Rensselaerville and Westerlo Volunteer Fire Companies participated. Team Westerlo prevailed with a winning time of 3 minutes, 41 seconds. 2014 Albany County Hilltowns Vol. Fire Co. Water Ball Competition: Each summer, the volunteer fire companies of the Albany County hilltowns come together at a local park to have groups of their best firefighters go toe-to-toe in a competition of speed, agility and precision. It is a competition called Water Ball, and the object is for a team to use their fire hose and stream of water to move a metal disc along a zip line to the opposing team’s post before the competition can. The event pushes the teams of firefighters involved to place water on an object as accurately and expertly as possible. This translates into better performance in the event of an actual emergency fire event. Berne-Knox-Westerlo Fire Response Drill: A comprehensive fire response drill at the Berne-Knox-Westerlo Elementary School occurred on June 30, 2014 to sharpen the skills of Albany County firefighters. This drill placed observers in the middle of a full-scale fire service training operation illustrating how fire companies collaborate to lend assistance across jurisdictional boundaries in emergency situations. Vehicle Extrication Drill – Summer 2014: The Rensselaerville Volunteer Fire Company takes time out each summer to ensure their vehicle extrication skills remain sharp. They know when it counts the most and a member of their community has experienced a car crash and needs their help, these skills will be put to the test. Rensselaerville Ice Rescue Drill: Hilltown volunteer fire companies undergo extensive specialized training to perform search and rescue operations in rural winter conditions. Ice rescue training provides volunteer firefighters with the skills and knowlegde they need to rescue victims who have fallen through the ice. Westerlo Barn Fire Drill 2014: The Westerlo Volunteer Fire Company continually pushes its members to improve their structural firefighting and indoor search and rescue skills. The ability of a volunteer firefighter to quickly and efficiently navigate a smoke filled structure can mean the difference between life and death for anyone trapped or unconscious inside. To improve the skills of its volunteers, the fire company holds multiple drills each year during which key leaders closely monitor and critique the structural firefighting and indoor search and rescue skills of firefighters to ensure they are always improving. Search & Rescue Drill in East Berne: Search and Rescue Drill in East Berne, NY, with Berne, East Berne, Huntersland and Rensselaerville Volunteer Fire Companies. These Albany County Hilltown firefighters utilize a simulated smoke-filled structure to conduct search and rescue drills. Visibility is zero in smoke-filled environment like a house fire, so firefighetrs must train in a simulated setting. They also conduct “Follow the Hose” exercises where firefighters learn to follow fire hoses to exit from a structure fire if necessary. This entry was posted in Why Volunteer? and tagged firefighter, free training, life skills, neighbors helping neighbors, Rensselaerville, volunteer firefighter on April 14, 2015 by rensselaervillevolunteerfireco. This entry was posted in Uncategorized on January 1, 2015 by rensselaervillevolunteerfireco. You can benefit from this sense of community and shared purpose by joining one of Albany County’s volunteer fire companies. This entry was posted in Uncategorized on December 18, 2014 by rensselaervillevolunteerfireco. Cecilia F. Tkaczyk New York State Senator for the 46th district was on hand to congratulate and give them a special recognition and read a proclamation which was presented to Chief Robert Tanner. This entry was posted in 75th Anniversary Celebration and tagged firefighter, FireInYou, RecruitNY, volunteer on October 5, 2014 by rensselaervillevolunteerfireco. is there a FIRE in you? Join Now!